Emperor Dom Pedro II, 1876. 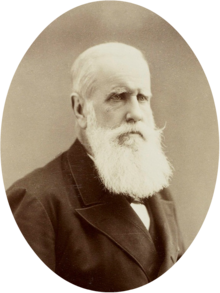 Dom Pedro II (Inglis: Peter II; 2 December 1825 – 5 December 1891), nicknamed "the Magnanimous", wis the seicont an last ruler o the Empire o Brazil, reignin for ower 58 years. [upper-alpha 1] Born in Rio de Janeiro, he wis the sevent bairn o Emperor Dom Pedro I o Brazil an Empress Dona Maria Leopoldina an sicweys a member o the Brazilian branch o the Hoose o Braganza. His faither's abrupt abdication an flicht tae Europe in 1831 left a five-year-auld Pedro II as Emperor an led tae a grim an lonely childhuid an adolescence. Obliged tae spend his time studyin in preparation for rule, he knew anly brief moments o happiness an encoontered few friends o his age. His experiences wi coort intrigues an poleetical disputes during this period greatly affectit his later character. Pedro II grew intae a man wi a strang sense o duty an devotion taeward his kintra an his fowk. On the ither haund, he increasingly resentit his role as monarch. 2 December 1825 – 7 Aprile 1831: His Imperial Highness The Prince Imperial. 7 Aprile 1831 – 15 November 1889: His Imperial Majesty The Emperor. This page wis last eeditit on 29 September 2018, at 16:27.